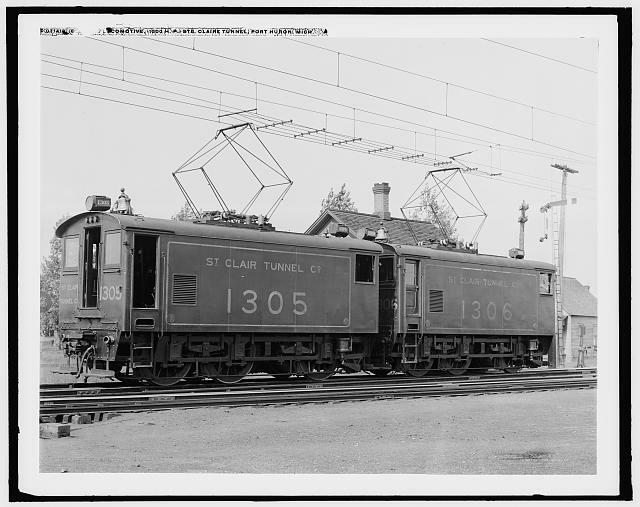 The St. Clair Tunnel Company was not part of the Canadian National Electric Railways system. It was operated as an independent subsidiary of the Grand Trunk Railway, however, it is included here due to its association with Canadian National Railways. The first St. Clair Tunnel remains an engineering wonder even after more than one hundred years in operation. Running under the St. Clair River, which joins Lake Huron to Lake St. Clair, the single bore tunnel provided a link between Sarnia, Ontario, Canada and Port Huron, Michigan, USA. On October 24, 1891, the first revenue freight train passed through the tunnel from Port Huron to Sarnia, however, it was not until December 7th that the first passenger train travelled through the tunnel. The ferry boats were then removed from service. In 1898, one was transferred to Grand Trunk's Windsor ferry operation while the other was sold. 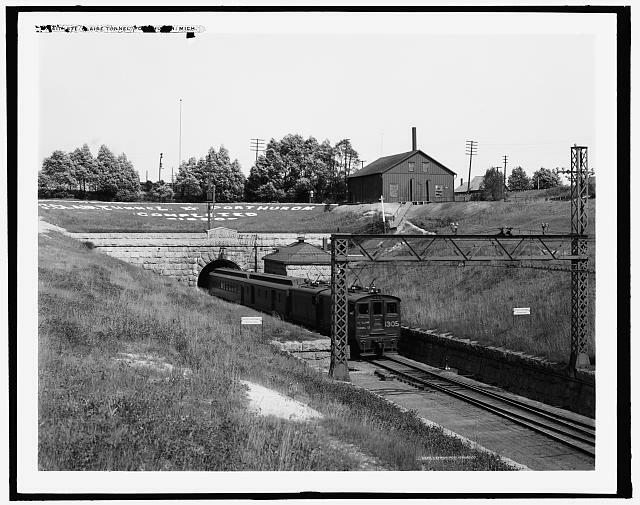 The St. Clair Tunnel Company operated as an independent subsidiary of the Grand Trunk Railway until 1923 when the GTR was absorbed into the Canadian National Railways. For motive power, four 0-10-0T steam locomotives were used. Built by Baldwin Locomotive Works of Philadelphia in February 1891, they were numbered 598-601 having serial numbers 11586, 11589, 11590 & 11595. Originally built as camelback engines with side mounted water tanks, they later had tenders added to extend the time between fuel and water stops. The side tanks were removed in 1898 subsequent with renumbering to 1301-1304. Engines 1301 and 1304 had the cabs moved to the usual position at the rear of the boiler. The engines were again renumbered in 1910 to 2650-2653. #2652 was scrapped in 1916. The other three steam locomotives were scrapped in 1920. Built jointly by Westinghouse and Baldwin Locomotive Works, the new electric locomotives were designed to operate at 3300 volts AC. 1305-1309 were built in 1907 and carried serial numbers 29993, 31823, 31870, 31924 & 31871*. 1310 was built in 1908 with serial 32851. 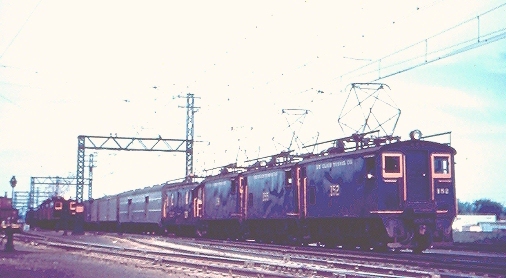 In 1910, the electrics were renumbered 2655-2660, then to 9155-9150 respectively in 1923. A single locomotive, 9156, serial 59767, was delivered in January 1927 by Baldwin-Westinghouse as a result of increased traffic and train sizes. Two second-hand locomotives, 9175-9176, originally Chicago, Lake Shore & South Bend Railway (renamed the Chicago, South Shore & South Bend Railroad in 1926) 505-506, were purchased in March 1927. These were also Baldwin-Westinghouse products, built in September 1916 with serials 43681 & 43682. In December 1949, the electric locomotives were again renumbered by simply removing the first digit. This was done to free up the 9000 series in CNR's diesel numbering system. Withdrawn from service in 1958 when diesels began operating regularly through the tunnel, the electric motors were all scrapped by April 1959. On May 5, 1995, a new tunnel built between Sarnia and Port Huron was dedicated. This new tunnel replaces the tunnel opened in 1891. * Builders plate 31871 is now in the Komoka Railway Museum collection. RELATED LINKS Decision No. 112-R-1993 Transfer Agreement (CN) - St. Clair Tunnel Co.